Prince (Leul) Paul Wossen Seged, Duke of Harar. Prince (Leul) Dawit (known as Makonnen Makonnen). In 1974, with the overthrow of the Ethiopian monarchy, the widowed Duchess of Harar and her sons were all placed under detention, with the exception of Prince Makonnen Makonnen (Dawit) and Prince Taffari who were abroad at school. After a long and harsh imprisonment, Princess Sara was released by the Derg regime along with the other female members of the Imperial family in 1989. A year later, her sons were also released from their imprisonment. Days before their release, Prince Dawit Makonnen was found dead at his home in Switzerland. After the fall of the Derg regime, Princess Sara and her sons were allowed to travel abroad. And after a number of years living in London, the Duchess has now returned to live in Addis Ababa. 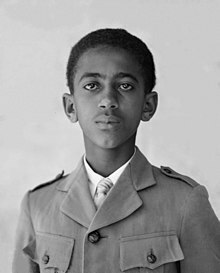 The Duchess of Harar was prominent at the Imperial funerals held for her brother-in-law, the Crown Prince Asfaw Wossen (also known as Emperor-in-Exile Amha Selassie I), the Emperor Haile Selassie I, and the funeral for Princess Tenagnework. It was widely believed that Emperor Haile Selassie favoured the Duke of Harar over all his other children, and it was even rumoured that the Emperor even considered naming Mekonnen as his heir, instead of his liberal elder son, Crown Prince Asfaw Wossen. However, Prince Makonnen died in a car crash in 1957 on his way to the resort town of Nazret from Debre Zeit, east of Addis Ababa. He was buried in the crypt of Holy Trinity Cathedral in Addis Ababa. Wikimedia Commons has media related to Prince Makonnen. This page was last edited on 5 March 2019, at 05:57 (UTC).